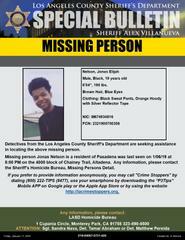 Los Angeles County Sheriff’s Department’s Missing Persons Unit Detectives are seeking the public’s assistance in locating Jonas Elijah Nelson. 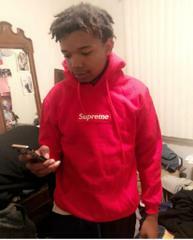 He is a 19 year-old male, Black who was last seen Sunday, January 6, 2019 at approximately 8:00 P.M. on the 4000 block of Chaney Trail, Altadena. Jonas is described as 6’04”, 190 lbs., with brown hair and blue eyes. Jonas was last seen wearing black sweat pants and an orange hoody with silver reflective tape. Altadena Mountain, Rescue Team has been searching the area where he was last seen. 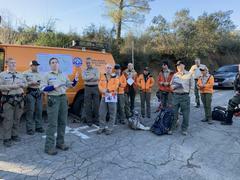 On Saturday we had members of Sierra Madre, San Dimas, and Montrose Search and Rescue Teams totaling 44 searchers spent 10+ hours on the hillside looking for Jonas. We were also joined by two Sheriff's helicopters, sadly we were not able to find Jonas.